Michael Musto, La Daily Musto, The Village Voice Blogs, 11/23/2010: Marlene Dietrich Listened To Records of Her Applause! Christmas 1962. Noel Coward was having a star-studded house party in wonderfully neutral Switzerland. After dinner, the double pianos were enchantingly taken over by Coward and Kay Thompson (you know, Liza's godmother; the fab woman who wrote Eloise and sang "Think Pink" in Funny Face). 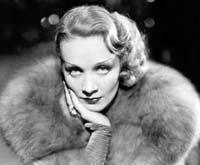 As a guest tells Sam Irvin in his new book about Kay: "Sitting in the corner looking bored was Marlene Dietrich--and she eventually disappeared because nobody was paying any attention to her. "Unfortunately, sometime later, she came back and in her hand she had some records. "She interrupted the evening we were simply adoring to say, 'Here, you must play this. These are my applauses.' "Records of applause! There was no music on them. Just the applause!" Irvin reports that Kay Thompson called that night "wet blanket time" and added, "Marlene could be a most humorless human being." Which is why I always keep all the records of my applauses to myself. Michael Musto, La Daily Musto, The Village Voice Blogs, 12/6/2010: Remembering the "Eloise" TV Movie Disaster In 1957, Kay Thompson agreed to let her classic Eloise tale of a bratty girl living at the Plaza get made into a TV movie, as long as she retained full creative control -- sort of like Eloise herself. The result was a bigger mess than Charlie Sheen's suite at the same hotel. According to Sam Irvin's new book, Kay Thompson: From 'Funny Face' to 'Eloise': Kay handpicked the film's perfectly named little star, Evelyn Rudie. 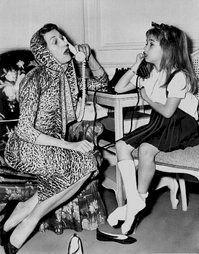 But in the midst of rehearsals, the author -- who'd stepped down from the Nanny role because it wasn't glam enough -- decided she should do the voice of the seven-year-old! So Rudie was told that whenever she spoke her lines, she should cover her mouth with a book and Kay would say the line from the sidelines! This caused problems during a live promo, when the girl lowered the book from her mouth too soon, and the result was very sci-fi. So CBS decided Rudie had to do her own voice. That resulted in Kay furiously coming in with a battery of lawyers and making the network agree to give up all future rights to Eloise, among other angry demands. The special was a bomb anyway, and it drove Kay crazy (well, crazier) when Rudie turned out to be the only element of it that got good reviews. She even got an Emmy nomination! These days, if Rudie ever puts a book to her face, I bet it isn't Eloise.